It looks as if it could be located in Europe, possibly a sports or performing arts arena of some sort. Certainly ugly at any rate. Any ideas where this might be? 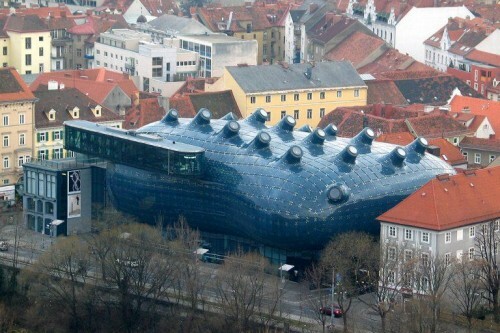 This is the Kunsthaus (in english: house of art) in Graz, Austria. Why do art museums have to be all artsy (read aesteticly fucked)? Absolutely resembles a fallen down building and sticks out like an angry hemoroid. Almost reminded me of a job one of my fellow installers did… There was a system installed in an INFLATABLE building. The air handlers were huge, for they had to blow the building up, which was just a huge stadium. I dont understand WHY they did this, but it seemed like a need idea, even though highly inefficient in the long run. Well….it looks like a tentacle monster that got spayed….